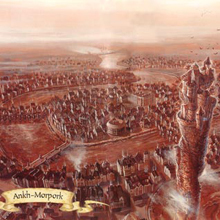 Ankh-Morpork is the largest city on the Discworld which some say is a fictional realm created by Sir Terry Pratchett but to a great many people is as real as Tamriel, The Shire and Gotham City i.e. completely. Lord Vetinari, the Patrician of Ankh-Morpork, wasn’t available to comment on the massive influx of Britons about to pour into his city but we have been assured that he will let us know when we want a word with him while his secretary told us that a special welcome awaits any and all mime artists.